Your eagerness to know more about foods you eat has landed you on this post. It is good to know what we eat to protect our health from potential side effects of additives if we suffer from any health issues or an allergy. The Food and Drug Administration (FDA) has a list of 3000+ items used to make foods. Some of them you have in your kitchen and you may be using them every day for preparing your dishes. However, there are many food additives which are added during processing of foods before they reach your home. You know about these additives if you read food labels. All the food additives are checked for any harmful effects on our health before they are added. The safe additives are used based on their established maximum allowable intakes. 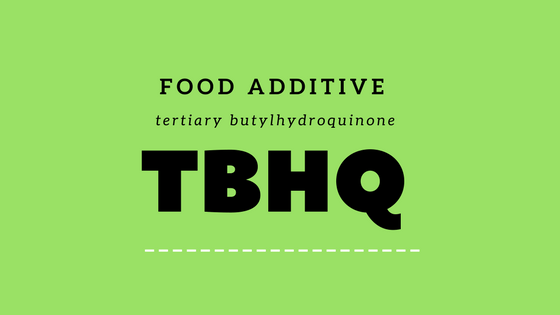 TBHQ or t-Butylhydroquinone (TBHQ) is a synthetic antioxidant used alone or in combination with butylated hydroxyanisole and/or butyl-1-4-hydroxytoluene (BHT). It is used preventing oils and fats from oxidative deteriorations which may result in bad smell and taste. In 1972, FDA had given approval for using it first time as an additive. The maximum allowable limit is already established for TBHQ which is 0-0.7mg/kg body weight of a human. You can easily calculate what could be the safe intake limit of TBHQ if you know your weight. (2) Here is a simple calculation for it: Suppose Mr. Tom’s weight is 72 kg then the safe consuming limit for Mr. Tom could be 0-50.4 mg.
What do the studies say about TBHQ? What is the significance of food additives? Food additives are used for varieties of reasons i.e. improving safety, look, freshness, and the taste of foods. They are tested for potential health risks before using. JECFA is an international body whose task is evaluating the safety of additives and establishing maximum safe limits of additives. However, the safe limits of all the food additives are already established and they don’t harm if they are taken as per the recommendation. Therefore it is advised to consume them as per their daily intake amounts. Always consult your Dr. because he could give you the best advice based on your diet and current and past health conditions. Previous Post How This Couple with 25 Years of Lovely Memories Going Great With Alzheimer’s Program Next Post What Is Weight Cycling And How Does It Affect Your Health?